The left of the two black streaks left of Dukey Corner. Starting with a boulder problem surmounting the shortest section of a vertical wall, climb up cool knobs, flakes, edges, and slab up the black streak. The route takes its imaginative name from a funky grey streak/dike to the left of the start – a geological feature that is not (yet) described in scientific literature. The crux is short and well protected, and there’s loads of very fun 5.9 range climbing on the pitch. There are some runouts on easier terrain near the top. 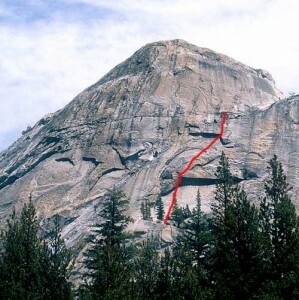 This is a great approach to the upper pitch of route C, actually a more logical approach than that route. Which SuperTopo guidebooks include a topo for Tectonomagmatic?